LeftRoots is associated with the Freedom Road Socialist Organization. It launched as a formal organization in 2014 with our first local branch in the San Francisco Bay Area. We are now working with comrades around the United States to start branches in a number of other cities. It came out of Steve Williams and N’Tanya Lee's Ear to the Ground Project. In 2018 LeftRoots "is a national organization of 250 frontline organizers and activists, committed to politically developing their members to lead social movements across the U.S."
The LeftRoots publication is Out to Win!. According to Carl Davidson, North Star 8/11/14. N’Tanya Lee and Steve Williams on their vision for LeftRoots. 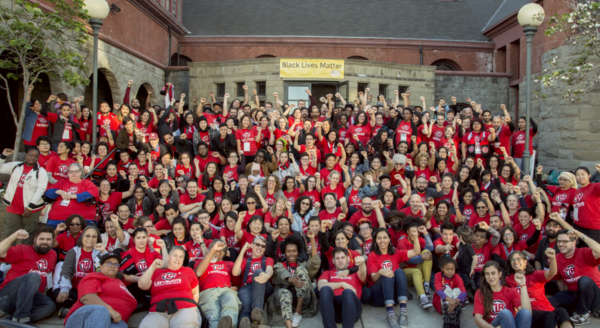 LeftRoots is a national formation of social movement organizers and activists who want to connect grassroots struggles to a strategy to win liberation for all people and the planet. Remarkably, it's already been a year since we launched LeftRoots. Starting a new kind of national Left project is, it turns out, not a small undertaking! Emerging from the intensity of this first year of organization-building, it's time to celebrate, and it's time to grow. You can help grow new Branches, contribute to our political and financial independence, and build towards a National Congress in 2018 to discuss and debate proposed Strategies for National Liberation. Together we can develop a "next Left" that's vibrant, skilled, rooted in working class struggles, and truly preparing to win. CELEBRATE! JOIN THE FIRST ANNIVERSARY PARTY FESTIVITIES! We launched the first LeftRoots Branch, with 50 cadre members in the Bay Area. Members are building a new type of vibrant, Left political vehicle whose points of unity, program and plans reflect lessons from 20th Century socialist experiments and our many generations of grassroots movement-building struggles. Over 400 movement activists participated in one or more of LeftRoots' 15 national online HangOuts and local Community Conversations. The vast majority are people of color, engaged directly in movement-building on the ground. We committed to build towards a national congress in 2018, before which we will develop grounded strategies for national liberation. LeftRoots members and families are developing a new kind of Left culture that reflects our values around participatory democracy, self-and-social transformation, protagonism, support & accountability, and grassroots feminism! We began building with some of the globe's most inspiring, new Left formations, like SYRIZA in Greece, Venezuela's Bolivarian Revolution, and South Africa's powerful, socialist workers union, NUMSA. Next, we will be launching new Branches in 2015! If you and a few activists are interested in participating in a local Assessment Process to help us identity where the soil is fertile for a LeftRoots cadre Branch - or for us to deepen relationships with organizers and activists in your community - please email us at left...@leftroots.net. As we celebrate this Anniversary, we're pushing for 100 LeftRoots supporters like you to become Compa Members in the next month. Signing up is easy. LeftRoots Compa are committed supporters of LeftRoots who 1) agree with the LeftRoots Points of Unity, and 2) make a monthly financial contribution to help ensure the success of this liberatory political project. Compa are part of the LeftRoots membership community, receiving special invitations to LeftRoots programs, including our national LeftRoots HangOuts and local Branch events. Your Compa contribution matters. Outside of the nonprofit structure, we are building a new kind of Left political organization funded more than 90% by Compa and Cadre membership dues and contributions. Cadre are now contributing between 1 to 5% of their annual income; and Compas have already contributed thousands of dollars. It is not a slogan to say that our capacity to grow nationally is entirely dependent upon you. SOCIALISM IS THE FUTURE! LET'S BUILD IT NOW! “Capitalism must go if humanity is to survive and if liberation is to be achieved…” END ALL OPPRESSION FOR LASTING HUMAN SOLIDARITY. “White supremacy, patriarchy, homophobia and other forms of oppression are deeply embedded in modern capitalism…” VICTORY WILL REQUIRE BOTH POPULAR MOVEMENTS AND AN ORGANIZED LEFT. “Liberation will only be achieved as a result of the power of the people…” STEWARDSHIP, NOT OWNERSHIP. INTERDEPENDENCE, NOT EXPLOITATION. “The planet is not a commodity to be possessed, owned and exploited by humanity for our own purposes. …” LIBERATION MUST CROSS ALL BORDERS. “All peoples around the globe have equal claim to justice and liberation… “ TRANSFORM SOCIETY, TRANSFORM OURSELVES. “The current order alienates us all from our ourselves, from our labor, from others and from the planet…” STRATEGY, NOT DOGMA, MUST BE OUR GUIDE. “Revolutionary movements must reflect the unique conditions of the nations in which they operate, which means that all effective movements must innovate…” Are you ready? We hope so! Because nobody from ruling class, nor any of their foundations, is chipping in to build a new Left organization led by organizers of color, committing to winning a society led for and by oppressed people and the working class. (And, we're not asking). It's up to all of us! In December, 2017, three LeftRoots cadres—Merle Ratner, N’Tanya Lee, and Rose Brewer—got to spend a few weeks on women’s delegation to Vietnam, one of the few surviving 20th century socialist experiments. On April 19, 2018, the three of them, along with LeftRoots compas and fellow delegates Cathy Dang and Juliet Ucelli, hosted a national LeftRoots hangOut to talk about their experience. The delegation included US-based movement leaders from the labor movement, Black Lives Matter and national women’s organizations. It was hosted by the Vietnam Women's Union. Education for Liberation: The Role of Political Education in the PAIGC's Struggle for Independence and the Lessons for Today. Center for Political Education and LeftRoots are proud to host a conversation with thinker and activist Sonia Vaz Borges. Sónia, who is of Cape Verdean descent, is a leading scholar on the education programs at the core of Amilcar Cabral's national liberation struggle in Cape Verde and Guinea Bissau during the 1960s and 70s. Sónia will help us develop a useful understanding of what militant education is, how it worked in the international struggle against colonialism in Africa, and its lessons for movement building today. 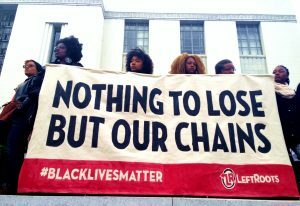 Steve Williams of LeftRoots and Rachel Herzing of the Center for Political Education will join Sónia to highlight some of the challenges and opportunities for theory, strategy, and unity facing our movements in the Bay Area and beyond. This page was last modified on 9 March 2019, at 00:51.